Sign up our loyalty program and enjoy all the benefits of a special service. Special service and exclusive benefits. 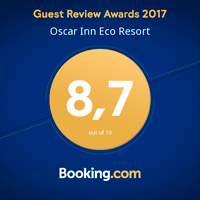 The Oscar Inn Eco Resort Loyalty Program was designed specially for you, who has already been receiving differentiated treatment in our complex. After 15 days in the resort, you get a free one. The program is private and not transferable, being valid for 12 months. The courtesy can be enjoyed in 6 months, but the guest will have to consult the availability of the hotel. Whoever pursues the Loyalty program has priority in the waiting list. Find out more details in “Program accession”, laid down below. Read the program terms below to understand how or Loyalty Program works. 1.1. – The guests access (exclusively for a legal person) to the LOYALTY program will happen by filling out the form at the end of this page. 1.2. – The points earned will be utilized in the Hotel. For this, the roomer must present the “LOYALTY PROGRAM” form at check-in. 1.3.- The roomer will receive his reward points, according to the number of days used in each lodging . 1.4.- The roomer will have his registration approved in the program since the moment he presents the form when he checks in. 2.1.- The punctuation in the Loyalty program is simple, allowing the roomer to understand the relation between the days he will stay and the points he will win. 2.2- For every 15 days paid for couple, the benefit awards a free day. 3.1. – The points will be used every time you pay the bill, before you leave the hotel, not being possible, under no circumstances, the distribution of the points in another occasion. 3.2. – The roomer will be held responsible for his point rewards request while paying the bill. If the roomer doesn’t ask for the score at that moment, he can’t claim these points later. The roomer associated with the program will be able to use his points in a period scheduled and according to the hotel’s vacancy. 4.1.- It’s understood by “prize” any service that the hotel will eventually offer, inside its facilities. 4.2.- The promotional offer offered by the hotel, consists of your stay as a prize. 4.3.- If there is any other kind of extra bonus for the Loyalty Program not referred to in this regulation, the roomer will be informed, through the reception of the hotel about it. 4.4.- The hotel reserves the right to cancel the prize request or even the Loyalty Program, because of frauds or erasures in the form. 5.1.- The delivery of points will be held for the payment moment. 5.2.- In case the roomer does not use the points, it will be available for his next accommodation, previously scheduledaccording to the hotel’s availability. 6.1.- The points will have validity ‘till the promotion ends, which can be cancelled, substituted, or changed, according to the hotel’s determination. 7.1.- The roomer, in the act of his accession to the Loyalty Program, allows the hotel to use the information submitted by him in the registration form, to send direct mail, packages or promotions conducted by the hotel, and exclusively for these purposes. 7.2. – Any modification in the registration details contained in the Loyalty program’s form, must be notified through our customer service facilities by e-mail. The roomer will be held responsible by loss or damage by the non veracity of the information. 7.3.- The accumulated points are not, under no circumstances , exchanged for money. 7.4. – In case the points are not enough to the prizes exchanging, there will not be allowed to add extra money or any other way of payment. 7.5.- Any change in this regulation, such as in the accession, awards criteria or punctuation, points accumulation, or any other item, will be informed to the roomer through the information in the registration form defined by the hotel criterion, exclusively. 7.6.- Doubts or clarifications about the Loyalty Program can be solved through the e-mail reservas@oscarinn.com.br . 7.7.- The roomer’s participation in the Loyalty Program will be exclusively regulated by this document, which can be replaced or changed , according to the hotel’s criterion. Complete the form below to send us your registration and join our loyalty program.